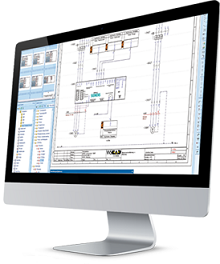 The WSCAD Compact Suite The Compact version is often used to create records of existing equipment, or the planning and development of small to medium sized projects. It can be particularly useful when existing equipment is to be enhanced or modified. It includes some basic intelligent automatic functions such as cross-reference generation, terminal diagrams, numbering and contact diagram creation. Cross-technology cable, connector, terminal, PLC, contactor and list management functions, multiple use of symbols, output interfaces for production, etc.